Are you ready for some football?! 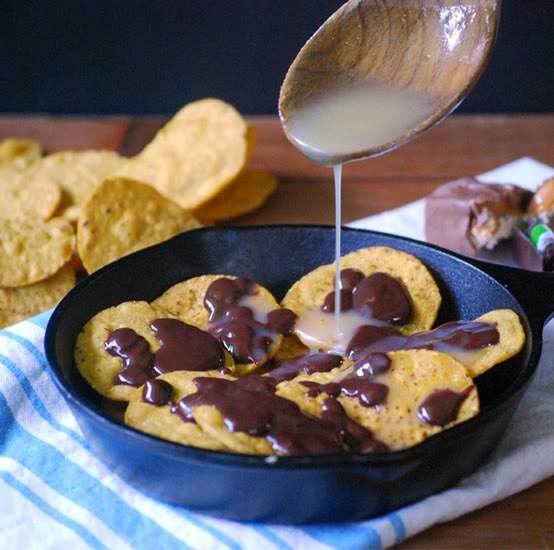 We are gearing up for some Sunday action with this unique take on one of our favorite football snacks - NACHOS!! 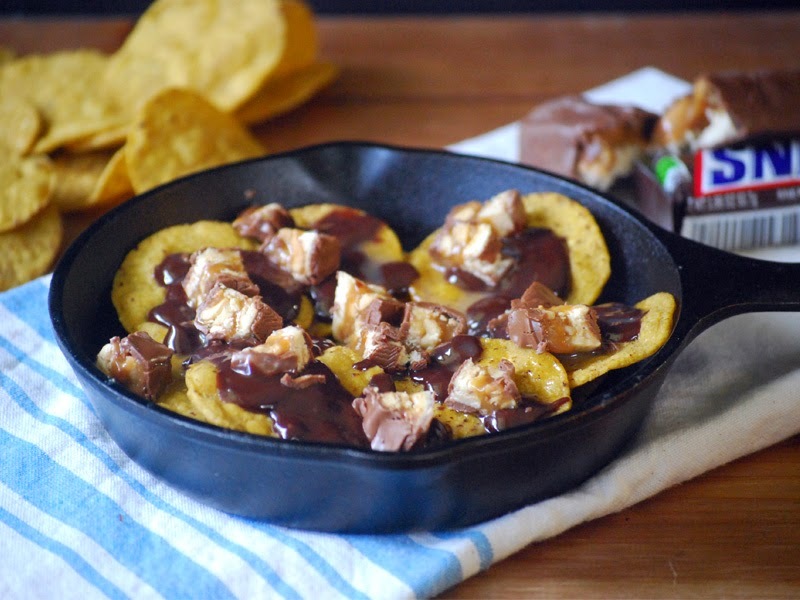 Our SNICKERS Nachos are packed full of sweet, salty, crunchy goodness you'll want to enjoy every weekend for sure! Madison picked up a bag of Sweet Potato Tortilla Chips and suggested we use them to make a dessert nacho. A dessert nacho? Is this a college thing? Oh, who cares! I like dessert and I like nachos, so let's smash them together! I'm game!! 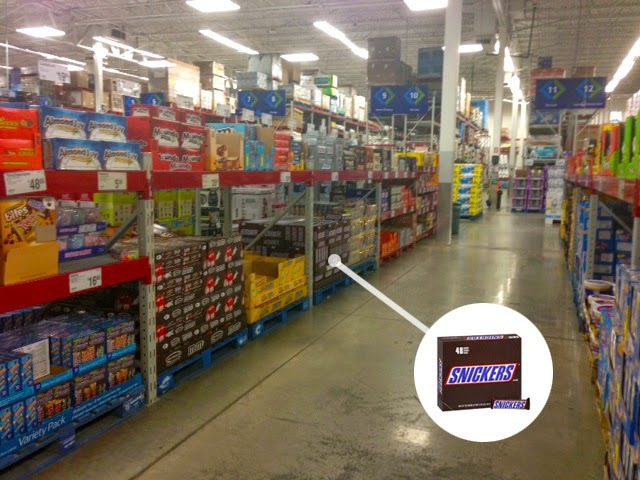 Because we love our SNICKERS bars, we went to Sam's Club and picked up a ginormous 48 count box! That will keep Don happy for a long time! That man has loved SNICKERS bars longer than I have known him! And just to make sure we don't run out, we also picked up a 105 count variety bag! Now that we've got our chocolate stash, bring on the football!! ...and so was the 105 count variety bag! 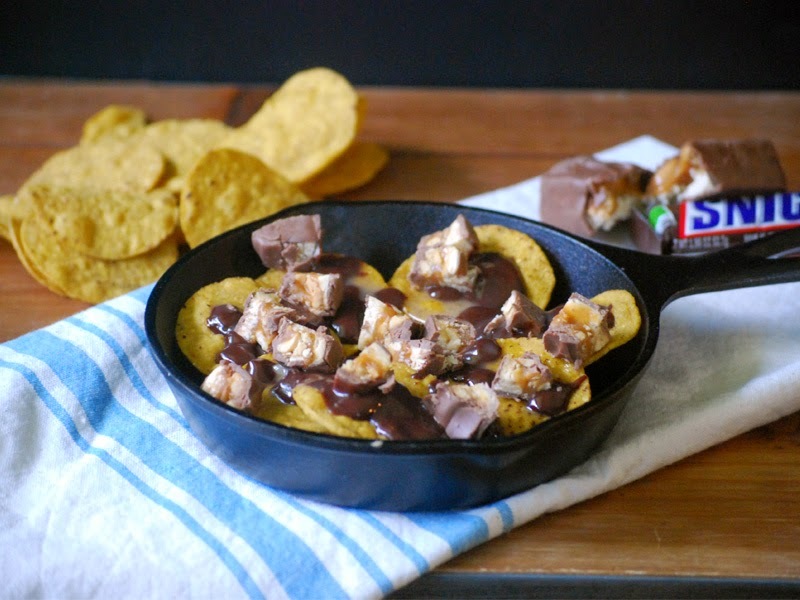 Here's how our SNICKERS Nachos came together... we grabbed a bag of Sweet Potato Tortilla Chips and tossed some in a skillet. Just enough to cover the bottom. I made chocolate ganache and drizzled some all over the chips. I have lots of leftover ganache, but it's okay!! I plan to pair it with the 105 count bag of assorted candy bars to make some no churn chocolate ganache ice cream with bits of candy pieces! Yummm! Next drizzle on some caramel sauce (this is my favorite part!). If you make my Homemade Caramel Sauce, you will have lots of leftover caramel and you can use that for many things like my Apple Chips with Salted Caramel and my Mini Apple Donut Skewers, but one of my faves is No Churn Salted Caramel Ice Cream. 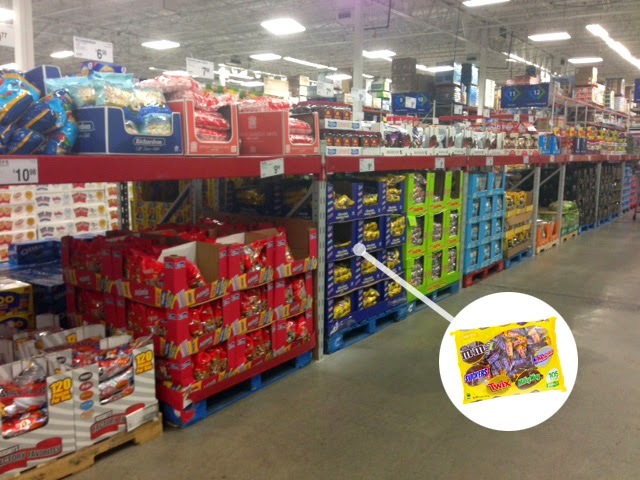 Join me in following Sam's Club on Facebook, Twitter, Pinterest, and on their mobile app!! Note: I left off amounts as they will vary according to the size of the skillet you use. 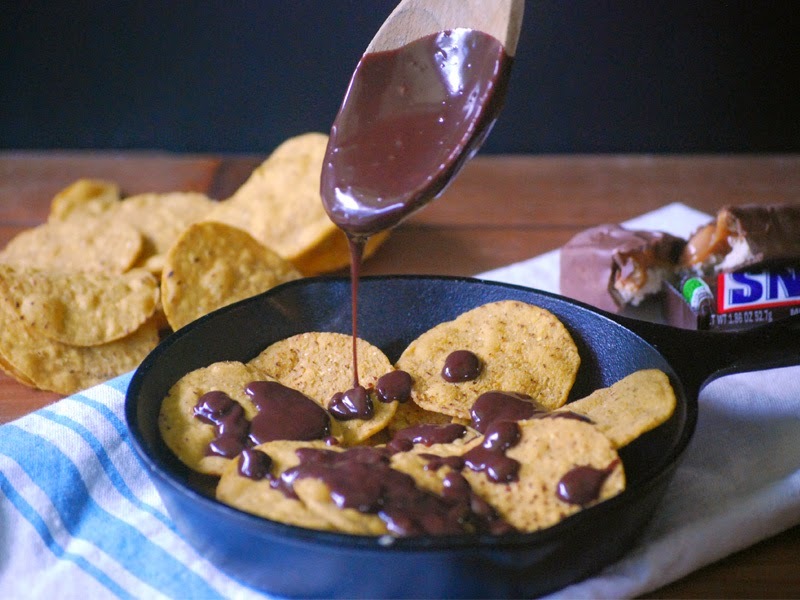 Make the Chocolate Ganache and drizzle over the sweet potato chips. Use as much or as little as you like keeping in mind the SNICKERS bars will add more chocolate flavor, so you might want to start off with a little and add more as needed. You will have ganache leftover! Drizzle some of the prepared caramel sauce over the sweet potato tortilla chips. You'll have more than enough caramel sauce. Use as much or as little as you like. Top with diced SNICKERS bar candy to your liking. 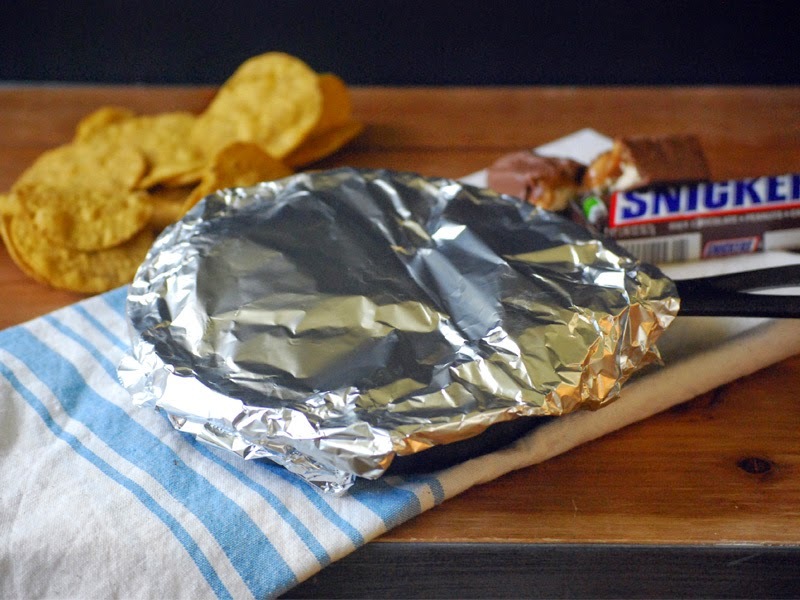 Place skillet over medium heat and cover with a lid or some foil and heat until SNICKERS bars start to melt. This will only be a minute or two. Enjoy! Wow, what a delcious and decadent dessert. I love that you melted the snickers. Yes, melted snickers was a must. It's funny, though, we only eat them very cold normally, so this was a fun new way to enjoy our favorite candy bar! Thanks for stopping by, Christie! WOW! I love a good salty-sweet combination! Me too, Martha! Thanks for stopping by!! Oh my! My husband's favorite treat is Snickers, so these must happen! Pinned! Thanks, Taylor! Our hubbies have that in common for sure! How fun! 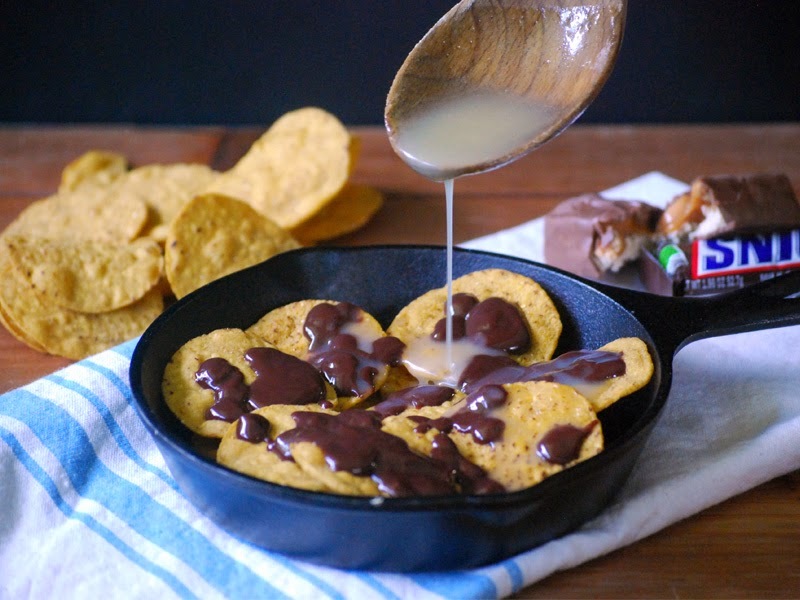 I always have leftover tortilla chips and now I can make dessert nachos! I can honestly say that I have never heard of a Snickers Taco so kudos for your creativity! These look great! I love sweet and salty combos! This is crazy yummy looking! Oh, I could dig into this! 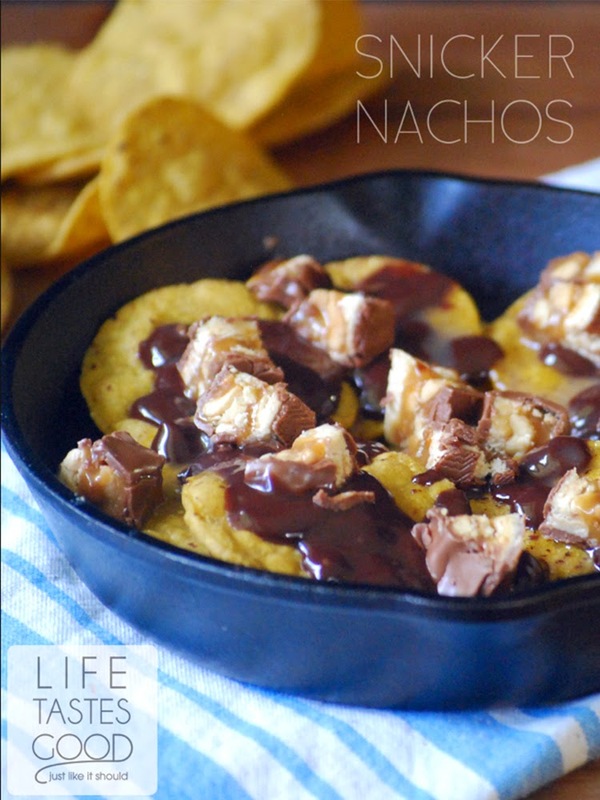 Snickers is one of my favorite candy bars, so I know I will love these nachos! Truly out of the box thinking here! Love it... never would of thought of it either. You had me at snickers! I never would have thought to pair snickers with sweet potato chips but I can totally see the sweet and salty, crunchy combo. I know I would love these! Oh my goodness! SNICKERS. NACHOS. I can't even. These look incredible. Such a sinful, decadent, amazing treat. An amazing blend of sweet and salty! Oh my god, stop torturing me with this deliciousness. lol. Looks so good. I'm pretty sure that would go over real well over here. It looks so good! Now this sounds interesting. I like when sweet and salty are paired. That would sure meet the sweet and salty requirement for a snack we all get from time to time. I like that it's unique. I never would have thought to combine these ingredients. This looks amazing! !